Nicely decorated large Birdhouse Gourd. It has wild sunny daisies on it. 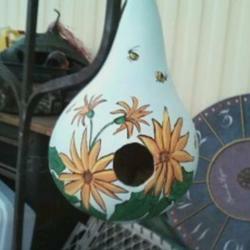 $15.00 Categorized under: birdhouse, daisy flowers, decorated, gourds. 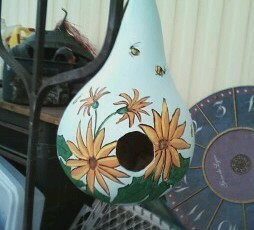 Marti has chosen a large gourd decorated with dasies and honey bees. This would make a nice addition to your garden. It will accommodate several different birds that are in your area. Check here for your payment, shipping and return information. You can c-mail Marti at [email protected] to handle the purchase of this gourd. Thank you for visiting and shopping in our store.